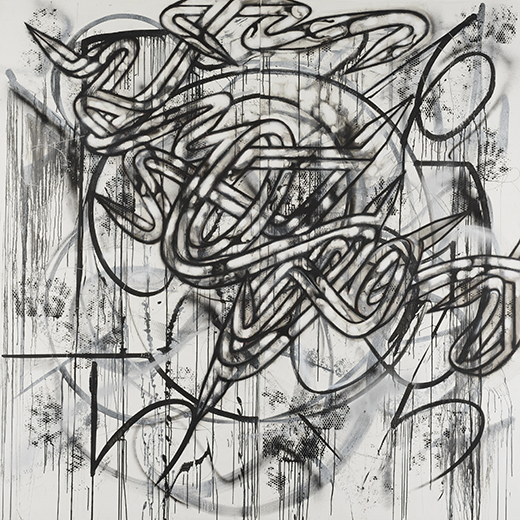 Enrico Isamu Ōyama’s “FFIGURATI 88,” a copyrighted work completed in 2013-2014, is acrylic-based aerosol, acrylic-based marker, graphite, latex paint and sumi ink on canvas mounted on aluminum and wood stretchers. The work, from the collection of IAM Gallery, is included in the artist’s exhibition at Kansas State University’s Marianna Kistler Beach Museum of Art. Copyrighted photo by Atelier Mole. An artist with a unique global perspective and style is the focus of the newest exhibition coming to Kansas State University’s Marianna Kistler Beach Museum of Art. “Ubiquitous: Enrico Isamu Ōyama” is on display Aug. 15-Dec. 23 in the museum’s Hyle Family Gallery. The exhibition surveys how Ōyama channeled his interests in the street cultures of Tokyo and American cities, Western abstract art and Japanese calligraphy to create Quick Turn Structure, his signature expression. Quick Turn Structure comes in varied creative platforms, including painting, digital media, sound and fashion. Through this artistic expression, Ōyama gives visual form to the mixed-race, multicultural, transnational experiences of people in today’s world of fluid borders and interconnectivity. The son of an Italian father and a Japanese mother, Ōyama was born and raised in Tokyo, but spent extended periods in Italy. In Tokyo, he immersed himself in an underground art scene infused with the street culture of the city, which was interwoven with global influences. In 2011, Ōyama came to New York for a residency sponsored by the Asian Cultural Council. He has since established his studio in Brooklyn. This exhibition is sponsored by Anderson Bed and Breakfast and made possible in part by a grant from The Japan Foundation, New York. • The north exterior wall of Little Apple Art Supply, 706 N. 11th St., in Manhattan’s Aggieville district, will become Ōyama’s mural lab from Oct. 5-28. • Art in Motion, an arts festival in the museum’s parking lot, 17th Street and Anderson Avenue, will be from noon to 4 p.m. Saturday Oct. 7. The free festival, which is open to the public, will feature a live painting performance by Ōyama at 2 p.m. The festival is concurrent with the Harmony in the ‘Hatt festival in Aggieville’s Triangle Park. • “Aeromural,” a sound installation by Ōyama, will be available Oct. 12-26 in the Mark A. Chapman Gallery in the university’s Willard Hall. It is hosted by the Digital and Experimental Media Lab in the university’s art department. The gallery is open 10 a.m. to 5 p.m. weekdays. • Ōyama will present the 1977 documentary “Stations of the Elevated” at 5:30 p.m. Thursday, Oct. 12. • “Dark Progressivism” will be presented by the film’s director/producer Rodrigo Ribera d’Ebre at 5:30 p.m. Thursday, Oct. 26. 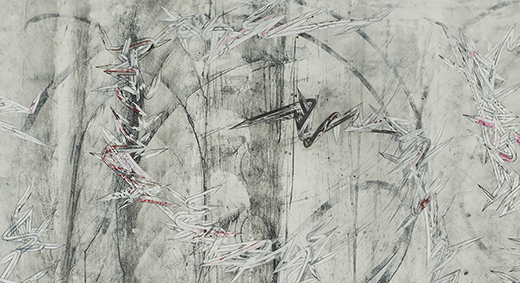 Detail of Enrico Isamu Ōyama’s “FFIGURATI 89,” a copyrighted work completed in 2013-2014, is acrylic-based aerosol, acrylic-based marker, latex paint and sumi ink on unstretched canvas. The work, from the collection of IAM Gallery, is included in the artist’s exhibition at Kansas State University’s Marianna Kistler Beach Museum of Art. Copyrighted photo by Atelier Mole.